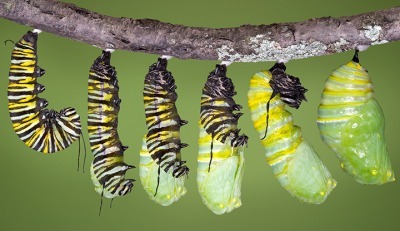 This image shows the process in which a caterpillar forms into a pupa. The definition of a pupa is the cocoon stage an insect goes through after the larval form and before the final form of the adult. An example of a pupa is a caterpillar being enclosed in a cocoon. "pupa." YourDictionary, n.d. Web. 17 April 2019. <https://www.yourdictionary.com/PUPA>. An insect in the nonfeeding stage between the larva and adult, during which it typically undergoes complete transformation within a protective cocoon or hardened case. Only insects that undergo complete metamorphosis have pupal stages. An insect in the nonfeeding stage of development between the larva and adult, during which it typically undergoes a complete transformation within a protective cocoon or hardened case. Only certain kinds of insects, such as moths, butterflies, ants, and beetles, develop as larvae and pupae. an insect in its development stage between a larva and an adult. From New Latin, from a special use of Latin pupa. A taxonomic genus within the family Acteonidae. The pupa stage of the ant-lion is quiescent. 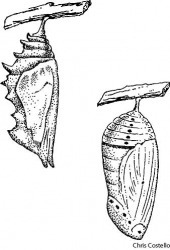 Pupa is named from its resemblance to a chrysalis, the apex being rounded. The wing, when not in use, is folded d Pupa of Dyticus. D, Its head more highly magni- c, Pupa of male.